A sore hip flexor kept Miguel Cabrera out of the Tigers' lineup last night, so he had to find other ways to keep himself entertained. Did he read a book? Bust out his iPad? No, he tried to shove a cookie into Brayan Pena's mouth. 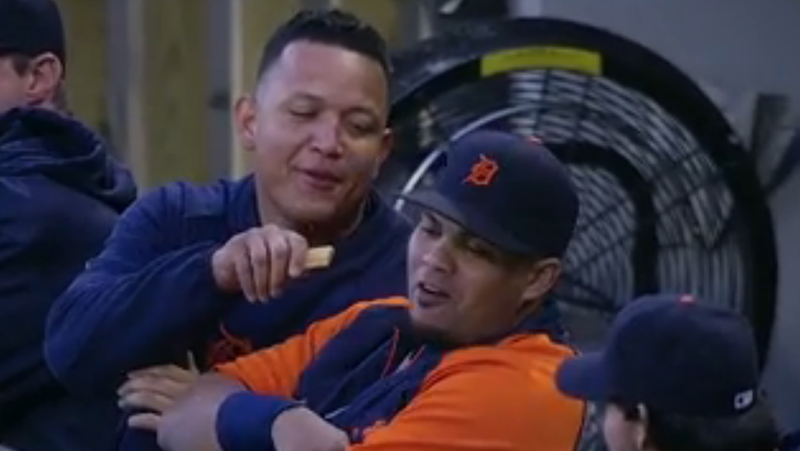 If you find yourself thinking, "Hey, Brayan Pena, why didn't you just take that cookie? Everyone loves cookies!" you should keep in mind that the cookie in question appears to be a Fig Newton, and that Fig Newton's are disgusting.